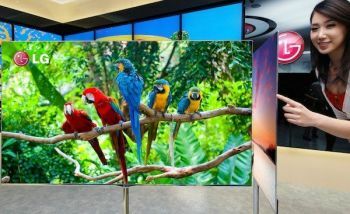 One week after LG Display officially announced their upcoming 55" OLED TV panel, LG Electronics now released their own PR with new details and photos - and some interesting marketing messages. They also revealed the model number: 55EM9600. LGE says that the new panel uses their 4-Color Pixel and Color Refiner features. The four colors (RGBW) are made from white OLED subpixels with color filters (Kodak's technology). The "Color Refiner" is a set of algorithms which improves and refine hues and tones. LG says that their OLED TV will generate the most natural colors of any TV set - at a much lower price point than could have been achieved using the standard OLED manufacturing process. LG gives some more details about the TV itself - it will weigh only 7.5kg, and be just 4 mm thin (which is a bit confusing - as LG Display said the panel is 5 mm thin. So which one is it?). We still do not know the release date or price of the 55EM9600 (although DisplaySearch estimates that it will cost $8,000 and be released in 3Q 2012).